John van Voorbergen, Temati BV, The Netherlands, explains why proper installation and inspection is crucial for ensuring the efficiency of LNG insulation systems. With temperatures of -167°C, issues with insulation in the LNG industry can be costly and dangerous. It all starts with the specification, where the right materials for these extreme temperatures must be specified. In Temati’s experience, however, the specifications are not usually the problem. More attention should be paid to the application of the insulation itself. In cryogenic insulation, the smallest mistake can cause major problems after start-up, and it is not easy to shut down an LNG installation for repair work. Today, there are a lot of external workers on site, mainly because of the lower costs. However, for the most part, they have little experience in cryogenic insulation, and there is a risk of poor insulation techniques. Inspections of the quality of the applied insulation on site – or off site in the case of pre-application – are a must on daily base. Figure 1. Wrong insulation dimensions. Last year, Temati was asked to inspect the insulation work on an LNG tank according to the specification and CINI. Several shortcomings were identified in the (pre-)insulated parts of the piping and equipment of the LNG storage tank. At the time of the inspection, the temperature was below zero, and yet there was no shelter/tent over the working place. For most sealants, adhesives and tapes, the temperature for application must be at least +5°C. So, with no shelter or heaters, the environmental temperature was already a significant problem at that time. 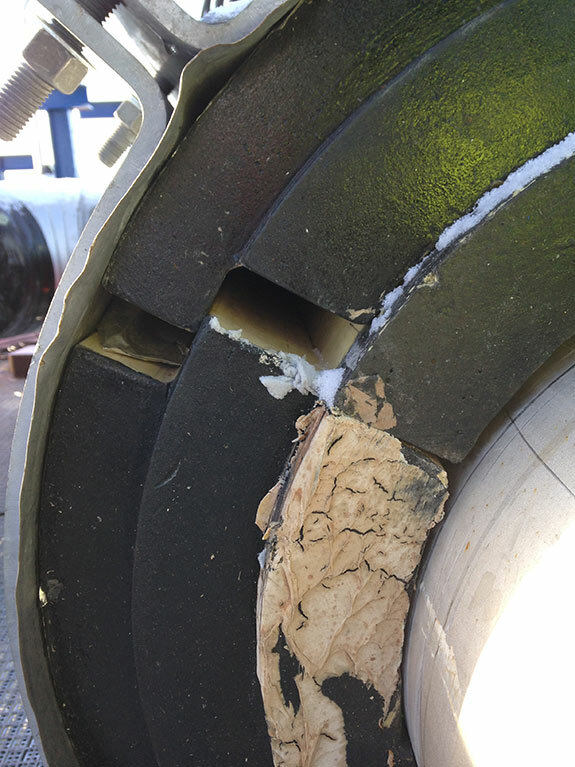 The inspection also covered the insulation of pipelines and pipe supports. 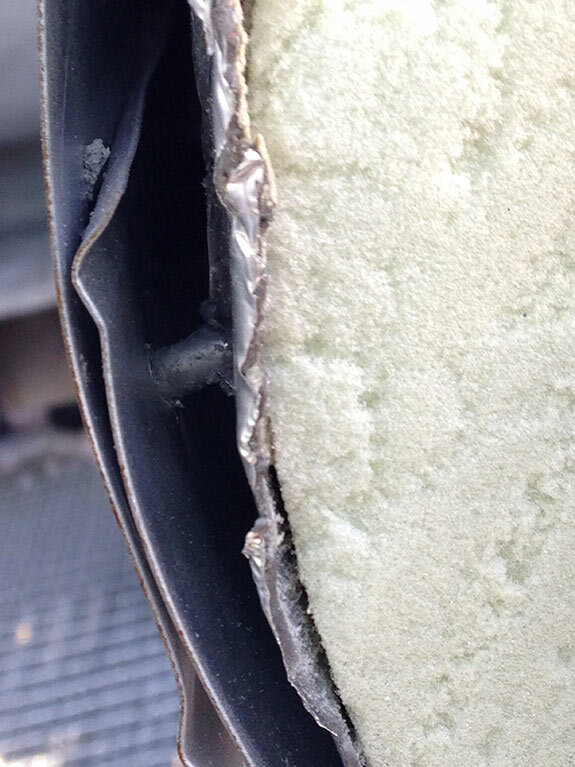 In this case, the insulation was in very bad shape: metal cladding was not in watershed position; screws/rivets were going through the primary vapour barrier; no or incorrect staggering of the insulation; unprotected supports and exposed to weather conditions; and no correct fitting of the insulation parts/layers (even big gaps were found). Furthermore, almost all of the insulation on the pipe supports was not correctly applied. There must be at least 50 mm distance from the structural cradle to the outer insulation joint to make sure that the insulation can continue correctly. Also, there were no vapours stops, or they were applied incorrectly. On the vertical pipelines, the insulation itself was moving down, creating big gaps in the insulation (typical for incorrect or missing supporting rings). A lot of insulation work was carried out at location off site, where it appears there were no inspections during application of the insulation. All problems found during inspection could have been handled during application, but there has to be an inspector on site to correct any problems found. This will prevent any problems such as those found during this inspection, and can lead to significant cost savings. 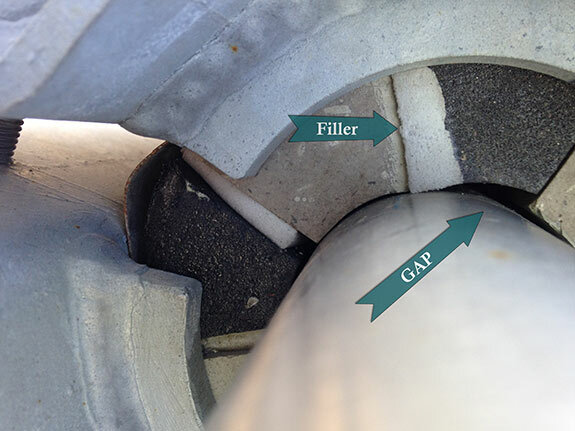 Pipe support with undefined materials, gaps and no vapour stops (Figure 1). No staggered joints (Figure 2). Puncture of rivet through the primary vapour barrier (Figure 3). Gaps insulation pipe support; no vapour stop applied; outer insulation inside the cradle (Figure 4). 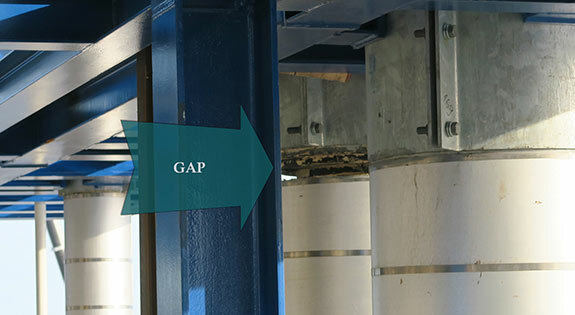 Gap insulation vertical pipe (Figure 5). Pipe too close to the support. Not possible to insulate in the correct way. 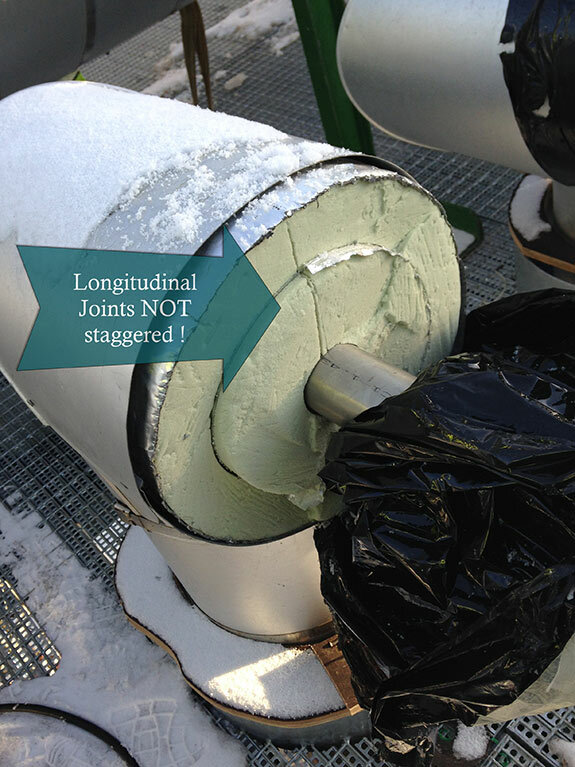 There are many ways to insulate the flange box in cold/cryogenic applications. Common practice is the use of polyisocyanurate (PIR)/polyurethane (PUR) foam or cellular glass sections. Combinations of these materials are also possible, but no matter what type of material is used, they must always fit the particular sections of each flange box. This makes it difficult in case of inspections or repairs, because the sizes of the boxes are all different and need their own specially shaped insulation sections. There is also the option to insulate the flange box with Handi-Foam – a two-component polyurethane foam – on site. The foam will spread out in the flange box and will give the best, uninterrupted insulation possible. The Lambda value of 0.023 W/m.k makes it an excellent alternative for the standard insulation methods. As there is no need for specially made parts for each flange box, it is easy to insulate the individual flange boxes. In addition to this, inspection or repairs can be done immediately, without having to wait for new insulation parts specially made for each box. Figure 2. No staggered joints. To make sure that it is also easy to take away the metal cladding after injection, the inside of the metal cladding will get a Vaseline coat. This will prevent the two-component polyurethane foam from adhering to the cladding, meaning that opening up the cladding for an inspection is easy. For cold/cryogenic applications, the high density Handi-Foam (40 – 45 kg/m³) is used. Standard density of the Handi-Foam is ±28 kg/m3. The Handi-Foam kits are ready to use, so no special tools are required. For working in cold environments, Temati can supply the heating belts to keep the kit at optimum operation temperature of ±25°C. To make sure that the Handi-Foam will get into every corner of the flange box, holes have to drilled into strategic points of the cladding. After injecting the two-component foam, these holes can be closed with a simple plug. Figure 3. Puncture through primary vapour barrier. Daily supervision on site and periodic job inspections by an independent insulation inspector will help to prevent a lot of problems and lead to significant cost savings. Figure 4. Big gaps in insulation. Figure 5. Incorrect supporting rings.